I am trying to find balance. Balance between running a business and the idea of being a steward of the land it sits on. 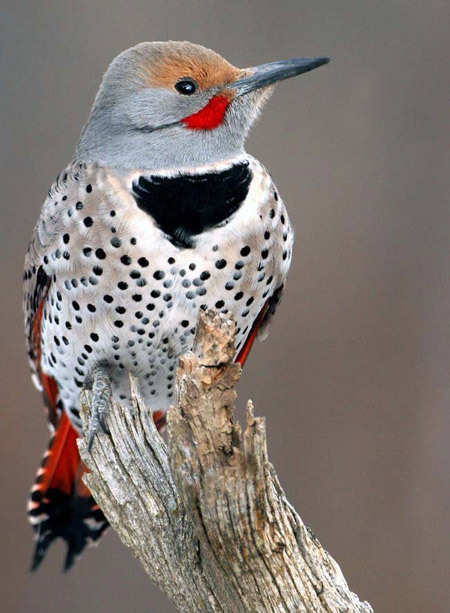 Recently, I am fighting a war against nature…specifically the Northern Flicker. It’s a bird. More specifically a type of woodpecker. It has butchered our barrel cellar since 2002. Henceforth, I will call it the F-ing Bird (“F” for Flicker, of course). Know your Enemy First off, let me say that the F-ing Bird’s population is dwindling but it is “widespread and common” and it’s conservation status is “least concern”. It makes its nest in excavated dead tree trunks…or in our case…in the exterior walls of our barrel cellar. Click here to hear the little darling. Back in 2002 this building was covered in a layer of styrofoam for better insulation before its final coat of stucco. The F-ing Bird knows when it pounds on this building’s walls they are not solid and begins digging out a cavity 13-16″ deep. The next year the F-ing Bird returns to this nest for its next little F-ing family. wrapped a wire mesh and even a metal strip of siding around the upper part of the barrel cellar (which looked ugly). The F-ing Bird just went lower. Then to the other side of the building. played bird distress calls which, I guess, were meant to make the bird so sad it didn’t want to bang on our walls anymore. Our F-ing Birds continued on like we had played a motivational tape. hung a rubber snake on the walls. Seriously. It didn’t stop the F-ing Bird’s hole making but we did get to spend endless hours explaining to tourists why there was a rubber snake hanging on the side of our barrel cellar. contemplated the elimination route but really, that is a losing battle. There’s always another F-ing Bird around the corner. Plan of Action I refuse to patch the holes yearly. I am not a fan of patching problems but not fixing their root causes (I could refer to liquor regulations here but would digress). At some point we will probably do one of two things. We will rip off the entire exterior of the 5,500 square foot barrel cellar, take the styrofoam layer off and re-stucco OR we will add a concrete layer on top of the stucco already there, then re-stucco. Both remedies are not in our budget for the next few years. 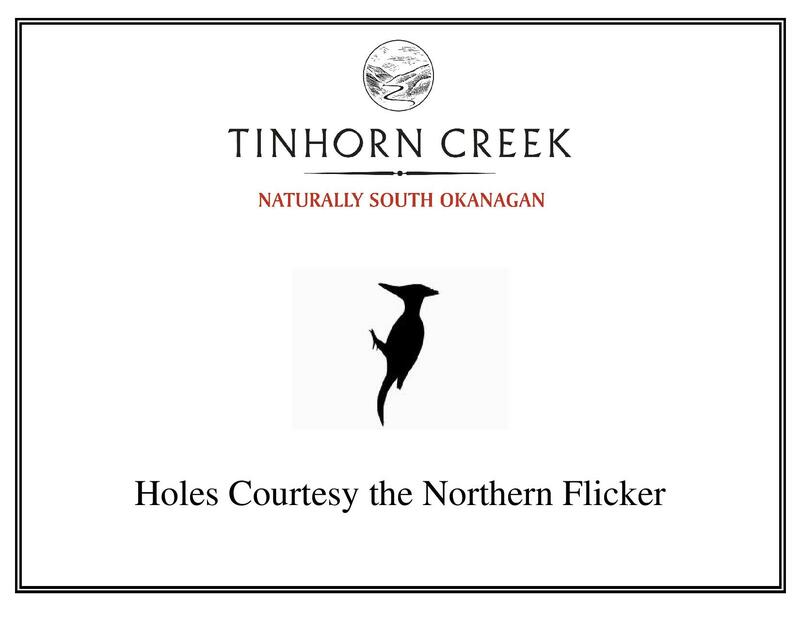 This entry was posted in Eco Sustainability, Grapes and Wine, Local, TInhorn Creek and tagged barrel, barrel cellar, bird, flicker, northern flicker, okanagan, stucco, Tinhorn, Tinhorn Creek, wine, winery. Bookmark the permalink. Hi Sandra – I sympathise! Rather than doing the concrete bit, have you evaluated gunite? It is a spray-on thin layer (as thin or thick as you want) of special concrete – applies over top of existing material – one-day’s work probably to do the entire building! Gunite is a definite possibility. Can they colour it like stucco? Also, I’d have to try out one side to see if they just bang right through it. Thanks for the suggestion! In the 80s I owned a house made of wood; despite being in a forested, fire prone area, all the houses in my neighborhood were ironically required to be made of wood. The place was high dessert despite all the trees around for the birds they chose…the houses. It was amazing how fast they could peck through 2 inch siding and get inside. Entire walls looked like giant vertical coo coo clocks or some kind of whack a bird on acid scene. Where they all came from or why they chose to assemble that year in one place remains a mystery. But bottom line was that nothing, and I mean nothing deterred them. Except for the final solution, plan 410. It was a shame, they were beautiful birds. Of course, we all admire your desire to live in harmony with nature, specifically these birds, but I am guessing most would forgive you for “loosing it” over these F’ing birds and go for the latter solution! Seriously, have you tried mounting facsimiles of their natural predators? According to what I found, not snakes, but raccoons, feral cats, and hawks! Maybe, just maybe, they will move their homebuilding efforts to the more desirable locale, and leave your building alone. Maybe. Perhaps get a nearby motel to post a “Birds Welcome Here” sign? Oh yea! I forgot! We did do the fake owls and fake hawk thing too. That never worked. The dead tree thing might work but it’s a pretty large building/area and I am not so sure the landscape architect has “dead trees” as a feature—but you never know! Huge dilema Sandra. I am worried about water entering the building if you do nothing unless its a concrete wall in behind. I know a rat trap below the hole works but I don’t think your visitors would enjoy that veiw. Metal siding saved one of our wooden buildings from them in the past. Good luck. if you re-stuccoed with a much smoother finish the birds would have a much harder time clinging on to the side of the wall. Would have to be very smooth though. Not sure if stucco could be applied that smoothly??? A layer of concrete would have to be thick enough to hide the fact that it is still hallow behind, else they may keep trying. Doing one wall as a test could give a false positive as they simply move to the other sides since they are easier access. It’s after you do the other 3 walls you may find that the concrete is not quite thick enough. For a dead tree as substitute “natural” habitat, a large dead Ponderosa Pine trunk could work and might fit into the environment aesthetically. But luring them to a tree just opens more nesting habitat for more of them. You’d still have the problem on the building if you did nothing to fortify the walls. I lived in an orchard in Kelowna some years back, picker shack converted to 2 nice modern apartments, surrounded by fruit trees, walnut trees, free range chickens and thompson quail. Side of the apartment was vertical fir planks. Flickers would wake me every morning as they continued on with their regularly scheduled excavation projects. The farmer/orchardist shot them regularly. Was not long till another picked up and continued the dig. Here in Kamloops we have an aluminum exhaust out the chimney for gas furnace and fire place. Flickers sit on top and drum on the aluminium cover piece. Not trying to excavate but they do it to sound out to other flickers. See them do it on telephone pole street light housings too. Makes for a louder sound that carries farther than pounding on wood. When they do it on the house the sound comes right down the chimney and reverberates throughout the entire house. Thank you Gillian. And thank you for linking your blog to mine. Very nice of you! Reminds of the year I would clean my sunroom windows and robins would randomly throw themselves into the glass. Making a new mess. It was the weirdest thing. And then they stopped. Oh Sandra, Frank just forwarded this to me and I must say that if youvwere not already a brilliant winemaker, you would be making your living as a brilliant raconteur! Aw, thanks. I have a very difficult time writing but I figure if I keep doing it it’s got to get easier! Sandra, in your area, it’s the Flicker. In the Cariboo, we have a problem with the Pileated woodpecker. In the 108 Mile Ranch area we have a problem with the woodpeckers pecking holes in the telephone cable! Yup, they drill a hole in the cable and then the weather deteriorates the wire inside and when it rains……….well, let’s just say that we bang our heads against the wall! 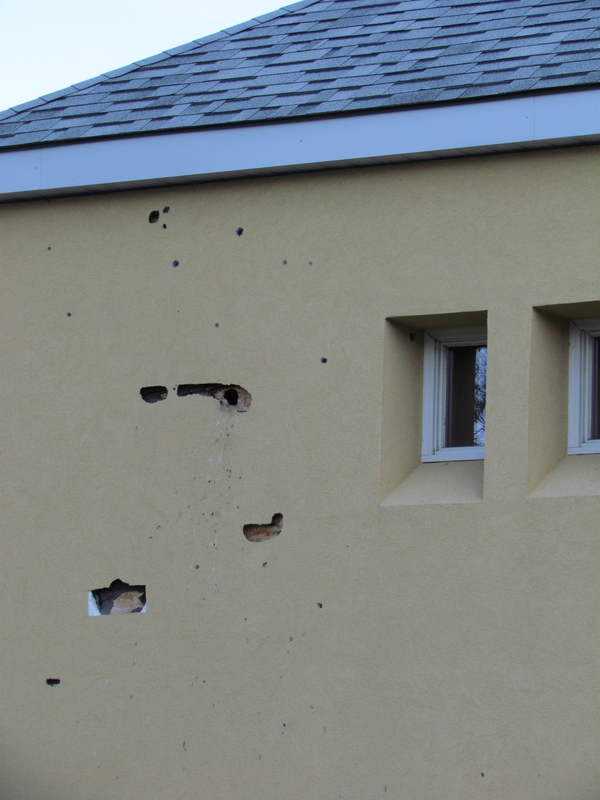 We haven’t come up with any solutions other than repairing the damage. I have talked with customers that have had to replace their wood siding with vinyl. We are going to install flicker houses and see if that does the job…next year. We’ll live with the holes for another year…and why not? They’ve been there since 2003! I love this story – I was looking for info on my non-destructive F-ing bird… He is roosting under our eaves (we have stucco over concrete over wood, and they are not interested in nesting, but it is amazing that he can hang onto the stucco for 12 hours while he sleeps!) And, btw, we are in Kelowna, regularly stop in on mini wine tours, and I have never noticed the holes! we live in Saskatchewan and last year we had this exact problem. not sure if the bird is the same, we had thought it was possibly a chickadee. But our house has the same Styrofoam insulation under the stucco as your barrel cellar. we shot the birds with a pellet gun and killed a couple, then filled in the holes and thought that was the end of the problem. a couple of weeks ago new birds showed up and started digging new holes. we have at least 3 spots on the house. they start very early in the morning right outside our bedroom windows (making sleep impossible). we are very concerned about the damage to the house. if you have any new information or ways to solve this problem, I would be very happy to hear from you. We found by shooting them it never helped. Nature finds way of procreating. There is a long term solution now in the Valley for a mesh system that goes down but expensive. Easier for us will be stripping off the insulation layer and just stuccoing it. At our wooden sided house we finally gave in and stuccoed. If the birds peck and hear a hollow sound they will continue to make a hole–unfortunately, our answer will be costly as it will require getting rid of the insulation layer. I wish I could be of more help to you. Two years after this blog post was written and our barrel cellar has not been fixed and looks worse.